Besides being a full-time CFIA veterinarian, Dr. Megan Jurasek is a graduate student at the U of S School of Public Health. Submitted photo. A love of horses drew Dr. Megan Jurasek into a veterinary career. But a love of learning and an eye for opportunity are taking the recent graduate of the Western College of Veterinary Medicine (WCVM) on a track to public service and regulatory medicine. Jurasek says classes she took at the WCVM – disease ecology and epidemiology, evidence-based medicine, zoonotic diseases and veterinary public health – piqued her interest in public health. A summer spent working with the Goat Pass-on Project in Uganda as part of Global Vets also opened Jurasek’s eyes to the possibilities. Created in 2006, the goat project involves the use of livestock to help improve the nutrition of the local community and create a sustainable livelihood for local farmers. 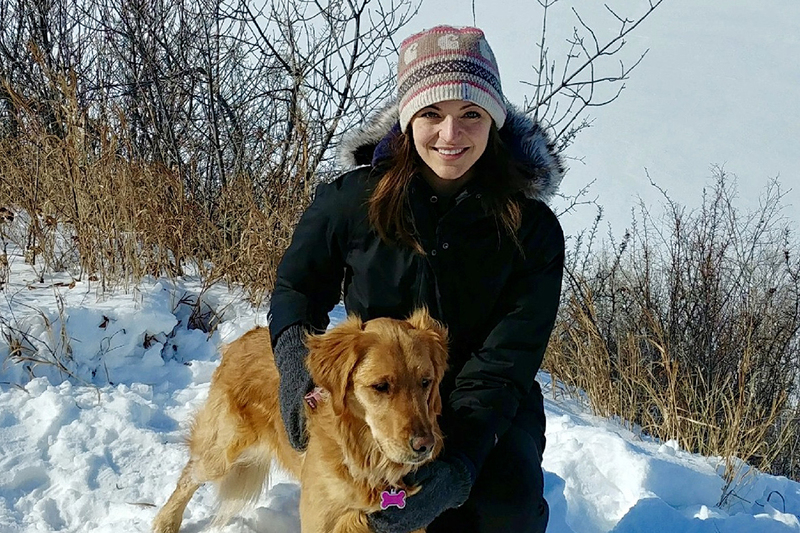 Jurasek is now combining full-time work as an animal health veterinarian with the Canadian Food Inspection Agency in Saskatoon with part-time studies in the Master of Public Health program at the University of Saskatchewan. “I really like that it’s a diverse program, and there’s a lot of opportunity to choose your own path within the program,” she says. In her home town of Sherwood Park, Alta., Jurasek started horseback riding at a young age, and initially planned on a career in equine medicine. After finishing her veterinary degree in 2016, she completed an internship at the Arizona Equine Medical and Surgical Center in Gilbert, Ariz. Following that experience, Jurasek was poised to study full time at the U of S School of Public Health. But she always kept an eye out for new job openings, and when Jurasek spotted an online posting for the CFIA job, she jumped at the chance. “I knew that it was an entryway into a position that I would hope to have someday,” she explains. Much of her work focuses on the import and export of animals, testing for disease and supervising quarantines. She and her colleagues also respond to disease outbreaks as well as incidents of federally-reportable diseases such as equine infectious anemia and chronic wasting disease. Fortunately, her WCVM education prepared her for such wide-ranging demands. Not only did her classes cover diverse species but also a wide array of diseases. These days, one of Jurasek’s greatest concerns is the outbreak of African swine fever in China. She notes that China produces over half of the world’s swine and is a big international trader. A viral disease that is highly contagious, “super-resistant” and with high mortality and morbidity, African swine fever poses a potentially significant risk to the Canadian swine industry if it ever spreads to this country, she says. Jurasek hopes to work in the field of veterinary epidemiology, and she sees plenty of opportunities within the CFIA for this type of work. Monitoring disease transmission, patterns of occurrence and prevalence is an important part of the work that the CFIA does. Members of the federal animal health team use the information and data collected from this work to make evidence-based policy that’s intended to prevent and prepare for disease outbreaks as well as to protect both human and animal populations. That’s good news for Western Canada and its numerous beef, dairy, swine and poultry farms. “It’s crucial to have veterinarians here to be able to continue to support those industries,” says Jurasek. Key to that is having a strong regional veterinary college in Western Canada that produces home-grown professionals who are more likely to stay in the region, she agrees. Jurasek also sees a valuable working relationship between the WCVM and the CFIA. For example, the two organizations collaborate on research and benefit from having expertise in different areas. The CFIA is involved in offering a veterinary regulatory medicine rotation for fourth-year veterinary students, and the federal agency also works with Prairie Diagnostic Services — the provincial veterinary laboratory based at the WCVM. Considering her path so far, Jurasek offers this advice to veterinary students: check out practice areas that aren’t so well known, such as regulatory medicine. Just like her, they may find opportunities they didn’t even realize are out there.